Oklahoma leads the nation in the per capita number of women serving prison sentences, a dubious national distinction. Many of the women in prison are serving time for nonviolent offenses. Some of these women are mothers, and their incarcerations often lead to family dysfunction, which creates even more problems. Recognizing the problem, the Oklahoma House passed a bill last week that could eventually help lower the number of mothers serving prison sentences for nonviolent crimes. Let’s hope the bill gets signed into law. It’s a much-needed first step. 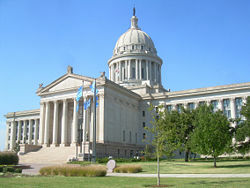 HB 2998, sponsored by state Rep. Kris Steele, a Shawnee Republican, would establish a pilot program that would help ease the reentry of incarcerated women with children. The program would identify women with children and develop a comprehensive plan for them, which might include diversionary sentencing rather than jail time. Right now, the prevailing law enforcement and state corrections philosophy, supported by neoconservative ideology, is to incarcerate as many people as possible. The basic idea is that severe punishments, including long prison sentences, will deter crime. Yet the incarceration rates keep growing. Oklahoma, for example, has the highest percentage of incarcerated women in the nation, according to the Bureau of Justice. Ultimately, this distinction should be the state’s shame, not a point of honor in a numbers game often played by political leaders and by some people who work in our judicial systems and law enforcement agencies. This bill will give women convicted of nonviolent crimes access to community-based rehabilitative services that have proven effective. As policy-makers, we can be both tough and smart on crime. The average prison stay for nonviolent women is less than a year, but the impact on their children is lifelong and devastating. In-home rehabilitative services will keep these families together and allow Oklahoma women to receive the help they desperately need. Again, this is a first step in a problem that needs even more serious solutions and initiatives. Keeping nonviolent women out of prison and ensuring they get treatment and counseling saves families and taxpayer dollars. track inventory, accounting, and recurring billing.